I’ve got into a habit of starting each blog with a quotation but I don’t think I’ll be delving into the archives of Japanese proverbs in the future, based on this example. I’ve been in England over the last week, principally to see my parents and deal with a list of odd jobs for them and, having spent plenty of time travelling by ferry and in the van, it truly feels like I’ve travelled a thousand miles. It’s good to be back and I’ve been impatient to start work here again. I can see a big difference in our five chicks and the rabbit is settling in well; the guinea fowl seem to have gone from neurotic to completely mad. (I’m a bit behind with the blog, so haven’t yet told you about these latest additions to our menagerie). And so back to blogging with a tale of subterfuge and intrigue, perhaps even “theft” in the countryside: a foot on the spade whilst keeping an eye out for les gendarmes. 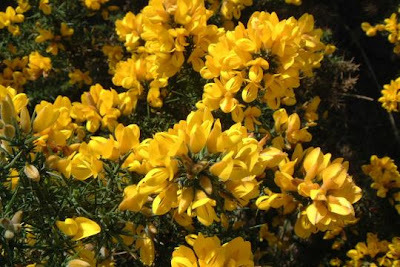 This is not the tale of the “Pink Panther” or other famous diamond but rather of the lowly shrub gorse (Ulex europaeus). This prickly plant is currently brightening up the roadsides with its yellow flowers. It’s a legume, which means its roots, courtesy of bacteria-containing nodules, fix nitrogen in the soil and nitrogen, of course, is a plant fertiliser. Gorse also produces seeds, which are of interest to our chickens, and it also encourages wild birds. Not bad, for what many consider to be a weed or pest plant. When ordering trees for our woods recently, I asked Alain if I could buy some gorse. He laughed at me and told me to just go and dig up un pied (literally, “a foot”) which I took to mean “dig some up by the roots”. Suddenly, everywhere I drove I could see loads of the stuff and was making mental notes of reasonably sized, accessible examples, with adjacent parking place. Eventually, I remembered to pack a spade… and the rest of the suspense (such as it is) relies on my guilty conscience: nervously trying to dig up a small example, with a beating heart, under the curious gaze of passing motorists whilst rehearsing my story should one of them turn out to be a French eco-policeman. I’ve dug in three plants, watered them in and am now waiting impatiently for improved soil, sated chickens and a plethora of visiting wild birds, I’ll keep you posted! 30 holes later for sapling Siberian pea shrubs along our fence and I too am waiting for "sated" chickens, better soil and in my case---a bit more shade for the livestock. In both our cased the wait is probably about oh...3 years for it though? Hopefully not longer!